Chris Hemsworth and Tom Hiddleston while staying in Brisbane, Australia, filming the latest installment of Thor, didn’t just enjoy the attention of the locals due to the fact they’re big stars. They used the opportunity to do a good deed and visited little heroes in the Lady Cilento Children’s Hospital and help them to keep the good spirit while staying there. 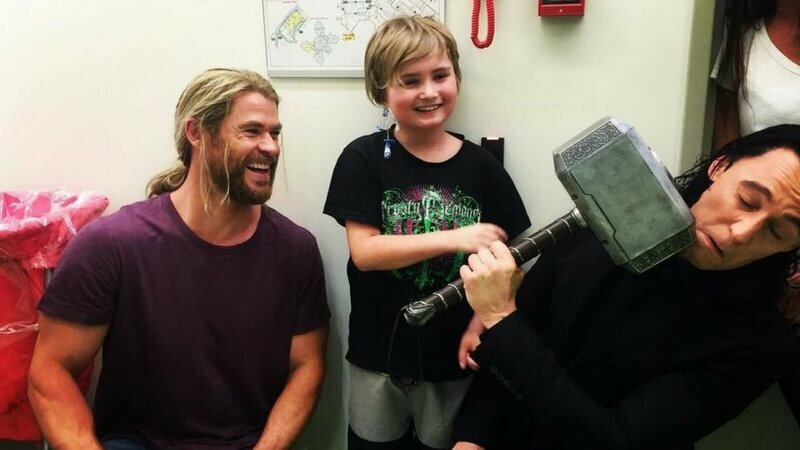 Thor and Loki came to the Lady Cilento Children’s Hospital and thrilled kids by their appearance and by bringing along the famous Thor hammer for good measure. You can see for yourself from the photos in the gallery how much fun they had together on that thrilling day. “Met the real superheroes of the world at Lady Cilento Children’s Hospital. A huge shout out to these brave kids,” stands in Hemsworth’s twitt. This is not the first time celebrities visited Lady Cilento Children’s Hospital. A few months ago Taylor Swift came to hang out with sick kids. Thumbs up for Taylor, Chris, Tom and all other generous and noble people and before all, thumbs up for these brave kids!